NEXCOM’s latest PowerDigiS software features a web-based remote management console and a user-friendly interface, allowing SMB retailers to manage digital signage contents with just a few clicks. 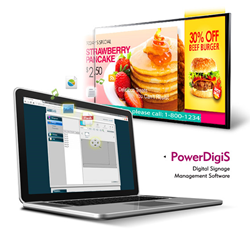 PowerDigiS is a user-friendly software designed to address a broad spectrum of digital signage applications. NEXCOM has released the free edition of its digital signage management software, PowerDigiS, to help enhance customer satisfaction and boost sales revenue for small and medium-sized businesses (SMBs) in the retail industry. NEXCOM’s PowerDigiS software features a web-based remote management console and a user-friendly interface, allowing SMB retailers to manage digital signage contents with just a few clicks. To accelerate the launch of marketing campaigns, PowerDigiS offers several layout templates to simplify the design of digital signage content. Using PowerDigiS’s content editing tool, SMB retailers can quickly create a customized layout based on a built-in template, which can be edited, saved and reused afterwards. After a layout is created, SMB retailers can drag and drop existing content files to each zone in the layout to create different content playlists for different zones. Individual content files and the whole presentation design can be previewed before being uploaded to on-premise digital signage players or central management servers. For ease of content management, distribution, and scheduling, NEXCOM PowerDigiS provides a remote management console which can be accessed through a web browser. On-premise digital signage players and a digital signage network can be managed from a distance without onsite visits, which enables SMB retailers to deliver the right message to the right audience at the right time. About NEXCOM: Founded in 1992, NEXCOM integrates its capabilities and operates six global businesses, which are IoT Automation Solutions, Intelligent Digital Security, Internet of Things, Interactive Signage Platform, Mobile Computing Solutions, and Network and Communication Solutions. NEXCOM serves its customers worldwide through its subsidiaries in five major industrial countries. Under the IoT megatrend, NEXCOM expands its offerings with solutions in emerging applications including IoT, robotics, connected cars, Industry 4.0, and industrial security.